1. Okay, I'm going to work my tail off this week. This Saturday, the most wonderful woman to ever step foot upon the soil of planet Earth is flying out to visit my family for a week. Yes, you guessed it, my mom. Otherwise known as Georgia Grandma. I don't want to work too much while she's here, so I'm trying for double time these next few days. So you're going to see a big jump in word count on THE SCORCH TRIALS, but then not much next week. Right at this second it stands at 59,485 words. 3. I also recently read GONE FOR GOOD by Harlen Coben. It was good, too. Though, you know what? I have a harder and harder time getting into the typical "beach book" these days. They just don't affect me. It's like, whoopty do, another plot twist. It's this guy, not that guy. Oh, this guy's alive, we thought he was dead. Oh, that lady's bad, not good. It just gets old. I think my favorite types of books right now are Young Adult and Stephen King. hehe. 4. So, I saw the movie KNOWING. I don't know what to tell you about this movie. It's worth seeing because it has some of the most amazing disaster sequences I've ever seen in a theater. Seriously, it's worth the price of admission just to see the plane crash. Holy cow. But I can't remember the last time a movie captivated me for so long, only to make me want to murder anyone within a hundred yards because of the last fifteen minutes of the film. I so want to spoil it, but I shan't. But here's a small hint how I felt about it: STUPID!!!!!!! 5. My favorite on American Idol: Adam. Download his performance of Ring of Fire from iTunes. It will creep you out and make you want to shout for joy. Seriously. Download it, even if you didn't love it on the actual show. It's amazing. 6. I gotta get back to writing!!! 1. I had an awesome time last night at The King's English bookstore. 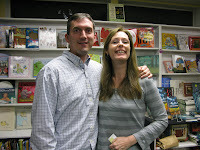 Laurie Halse Anderson (SPEAK, TWISTED, WINTERGIRLS, etc.) was there and it was like a huge party! Lots of authors and writers, lots of Laurie's fans. Here's a picture of me with the Guest of Honor, taken by my new friend Valynne Nagamatsu. Anyway, I'm here to tell you that this woman is incredible. Friendly, down to earth, genuine and sincere. Not to mention a brilliant writer and mega bestseller. I'm so glad I went. And get this: Laurie said last night that it was her best event. Ever. And she was very serious. Way to go King's English! It didn't take me long to go through them, make my comments (I think all of 2 in the whole thing). I've already sent them back to Krista. a. Punctuation ladders. This is when three or more sentences just happen to end on the right side, so you have three periods in a row, like a traffic light. Doesn't look good, so they mix it up somehow. b. Orphans. They don't like paragraphs ending with just one word. And they also don't like words being split between one page and the next. c. Italics. A lot of times, a phrase would be in italics, but not the punctuation at the end of it. Very hard to notice, but important I guess! Especially when it's a question mark. d. Maintaining consistency. I noticed at least 2 examples. One, having no comma after the next-to-last word in a series of words. (ya know, like Mr. Jones loved to eat turtles, porcupines, toenails and liver.) Also, sound effects were sometimes in italics, sometimes not. This was supposed to be corrected last round, but a few of them got missed. 5. I passed an important threshold in THE SCORCH TRIALS. It's now over 50,000 words, which I estimate to be about halfway. Boo yah! Hey, great news! According to my agent, this is very mega cool: my upcoming book, THE MAZE RUNNER, was one of six books chosen for the YA Buzz Forum at Book Expo America (NYC, May 28-31). I get to be on the panel with my editor (Krista Marino) on Friday at 2:30. Read the announcement: CLICK HERE. EDIT: And today it was in Publisher's Weekly: CLICK HERE. Speaking of BEA, I don't think I ever told you guys about my drama. Originally I thought I was going for the publisher of 13th Reality, but then that got kaboshed (because of the economy I guess). I was heartbroken for a little while, but then Random House said they wanted to bring me out for a dinner and a signing. And then this Buzz Forum thing happened on top of that. So, I'm going, and now you know why I'm so excited! To have it, then not have it, then to have it again actually makes it a little more sweeter. And I'll appreciate it much more. Can't wait. Better yet, my wife and I are going out a few days early to experience the Big Apple for the first time. Which brings me to another thing. My pre-pub buzz tour has been pushed back one week (now May 11-15). They told me it was because some Little, Brown author was already scheduled for that prior week. Also, since I'm going to NY just 2 weeks after that, they removed NY from the tour list and replaced it with Washington DC. So now it's San Francisco, Seattle, Salt Lake City, Chicago, and DC. That's gonna be quite the time span - right after BEA I'm going to the big BYU writer's conference with Krista. Anyway, just wanted to share. If you missed my review of THE FOREST OF HANDS AND TEETH, read my prior post. It's a great book! THE SCORCH TRIALS now stands at 47,130 words. Today I would like to tell you about an incredible book. 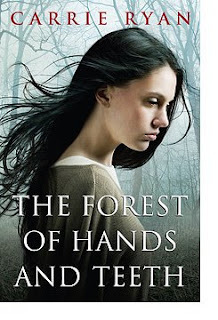 Now, in the interest of full disclosure, I have to tell you that THE FOREST OF HANDS AND TEETH by Carrie Ryan is from the same publisher (Delacorte) and the same editor (Krista Marino) as my book, THE MAZE RUNNER. But, you know what? So are a lot of other books. I really loved this one in particular. As anyone who reads my blog knows, I despise spoilers with all my heart. So I give very brief and very non-informative reviews. Here it is: this book is awesome! Come on, ain't that good enough for you? Seriously, it's like THE VILLAGE meets LEGEND meets ROMEO AND JULIET. It's creepy and it's heart-warming at the same time. And the bad people are called The Unconsecrated. I'll never forgive Carrie Ryan for coming up with that before me. Oh, and they'll give you nightmares, just in case you were wondering. Check this book out - I think you'll love it. It's now in bookstores nationwide. To see Carrie's really cool website, CLICK HERE. And here's you a bonus review, this time for a movie: DUPLICITY is really, really good! It's from the same writer and director as the BOURNE movies and MICHAEL CLAYTON. I love this guy. I love it. Keep it up cuz it entertains me greatly during the gaps. And don't worry, you've convinced me. We will be starting a forum soon. When, I don't know. But soon. 2. MAZE has started showing up in more and more places. Here it is on the Canadian Random House site: CLICK HERE Yay for Canada! Now, unless you're my mother, I don't expect you to actually look at all of those links. But it's just kinda cool to see it popping up everywhere. Now I just can't wait till they finalize the cover so I can quit seeing those awful "Cover not available" signs. 3. SCORCH is now up to 40,360 words. Loving every minute of it. Today I had to brainstorm to describe a shovel in the most vicious way possible. My good friend and author Emily Wing Smith helped by doing some research here in the SLC Library (yeah, she could've used Google, but where's the fun in that?). Shovels. Fascinating things. Let's just say my shovel ended up having teeth. 4. Check out this schedule for my prepub buzz tour: On May 4th I'll be in NY. May 5th, Chicago. May 6th, SLC. May 7th, San Francisco. May 8th, Seattle. That's a lot of flying in 5 days. Can't wait! 5. If you live in Utah, come see me at the Sugarhouse B&N this coming Monday night! 6. Finally, a favor. If you've read THE HUNT FOR DARK INFINITY, please go review it on Amazon. Let the world know what you thought! I think my brain has finally emptied of any and all contents. I'm sitting here in Barnes and Noble, and I can't think of one thing to blog about. I'm a sad, sad little man. Guess we'll just go completely random. 1. Finally caught up on LOST. I love it, I truly do. SPOILER ALERT: But I have to admit I'm very disappointed it went the time travel route. I just think time travel is way overdone and it never makes complete sense when you really, really think about it. Oh well. Still worship the show. 2. I'm growing weary of AMERICAN IDOL. The only thing that keeps me going is Simon. He's always right and I always agree with him. But yeah, he's kind of a big fat jerk. 3. DUMA KEY by Stephen King is excellent. Sometimes I finish reading a page or two by that guy and have to put the book down in wonder. I just don't know how he does it. 4. It's that time of year again for the NCAA tournament. I'll do my picks as usual, but I don't know why I bother. My wife always beats me. 5. THE SCORCH TRIALS is now up to 34,000 words. I'm a little worried because it's getting pretty bleak. Maybe I need to figure out a way to add some clowns. Nice clowns, not the creepy kind. Strike that. There's no such thing as a non-creepy clown. Anyway, I really think this book will end in a way that makes you sit up all night thinking about it. I better get back to work. Lots of writing to do. You guys can entertain me in the comments: what random things are YOU thinking about today? 1. I'm sitting in a Barnes and Noble in Mesa, Arizona and just met the coolest lady in history. Her name is Donna Powers and she's the CRM here. Pretty sure no one has ever made me feel so welcome and important in such a short period of time. Thanks, Donna. You rock, and I won't forget. Plus, she bought me a strawberry frappuchino, the single greatest drink on planet Earth. B&N paid for it. Yeah, that's right. Free swag. 2. A good friend from growing up told me his daughter asked him the other day if I was going to be on Dancing with the Stars on TV. This made me laugh for at least one full minute. Her name is Riley and she's da bomb. 4. I still can't believe I'm going on a pre-publicity tour soon for (as my sister says, fuh-reaking) Random House to places like Chicago and New York. Every morning I wake up sure that it's just a dream. 5. Watched THE DARK KNIGHT again last night. Amazing. No wonder Christopher Nolan (co-writer and director) is in my acknowledgements for Book 2. Heath Ledger, we miss you. 6. If you haven't been keeping up on the creation of the Dashnog language in the comments, you're missing out big time. And I think we may have the first person in the history of computers not to let a silly thing like a broken space bar on a keyboard keep her from commenting. 7. The sequel to MAZE is now 31,204 words. I can't remember if I told you guys what the working title for it is. Well, it's this: THE SCORCH TRIALS. 8. THE HUNT FOR DARK INFINITY really should be showing up extremely soon in stores nationwide. Still not sure why the distribution hit some snags, and I'm very, very sorry. But based on early numbers and feedback, your patience will pay off. 9. In the Deseret Bookstore chain of 50 or so stores, I was the 8th bestselling item for last week. Not bad! 10. The first appearance in the history of the world where you can buy a book called THE MAZE RUNNER showed up on the Internet. It's the library edition of the audio version of all things, and I'm not sure it has all the details right, but I thought it was interesting: CLICK HERE. 11. If you live in Arizona, I'll be doing signings the next 3 nights in a row. For the schedule, hop on over to www.the13threality.com. Come see me! 12. Wait, there were only supposed to be ten things. Now there are twelve. Just to make sure you guys understand, don't get too excited about the pre-pub tour that's in May. I don't think those events are open to the public. But I should be coming to the same cities on the release tour in October. Then I really hope to meet all of you that commented from those cities!!!! And Tapestry100 gave us our first national book sighting for THE HUNT FOR DARK INFINITY! He saw it in on the shelf in a Borders in Chicago. I'd love to hear from others since the distribution on that thing was slow for some reason. Yeah, I know. Boo. Hoo. I love good news. No, really, I do. Wow, what an incredible day. My wonderful, awesome, god-like agent, Michael Bourret, sent me an email early this morning. Since he's two hours ahead of me and being the nice dude he is, he didn't want to wake me up. So the email said that he had good news and that I needed to call him. I figured I'd wait a couple hours since I didn't really care what he had to say. Well, not so true, but I DID use the bathroom first. 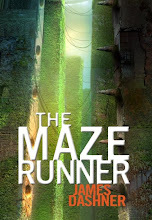 Anyway, the news: it looks like Random House is going to do some pretty incredible things to promote THE MAZE RUNNER. First of all, they're sending me on a pre-publicity tour to NY, SanFran, Chicago, Seattle, etc. in May, then on a full publicity tour when the book comes out. According to Michael, this is very rare. Sometimes they do one or the other, but rarely both. So yeah, we're stoked. Another exciting part of this is that it looks official: the release date has been moved up to October 13th. So we finally know!!! Now, none of this is set in stone, and with the economy, who knows what could happen. But for now, I'm going to enjoy the fact that these wonderful people think so much of my book that they're willing to commit these kinds of resources. In the meantime, I hope all my wicked awesome readers out there will enjoy the second book of THE 13TH REALITY. Have a nice day. Kinda good news/bad news from my publisher yesterday. The good news is that Barnes & Noble and Borders did order a nice amount of the book for all their stores nationwide. The bad news is that I don't think they'll show up in those stores until next week. We had a lot of faithful Dashner Duders show up at my signing in Orem last night. Thanks to JN, Q, Georgie, Becky, Deb... did I miss anyone? Thanks for coming! It's been a lot of fun doing events for this second book. Instead of being completely brand new to everyone, I always have people who have read the first book and loved it enough to come get the second one. And last night I had a girl come in who'd almost finished THFDI and I loved talking to her about a couple of twists in that one. I'm off to Arizona today, where I'll be doing several signings and a lot of school visits. The schedule should be up over at www.the13threality.com. I'm around 21,000 words for the sequel to THE MAZE RUNNER. I'm really trying hard to keep writing during this book tour so I keep the flow of the story fresh and good. It's not as easy as you think! See ya in Arizona. I know this post was boring. I'll try harder next time. I have to pack and get out of here! But have no fear, I can read the ever increasing insanity of our comment section from my phone. Later. Okay, what are the odds of this? Check out the description of the next Maximum Ride book coming out from James Patterson: CLICK HERE. Mr. Chu? A criminal mastermind? Come on! Well, at least I used the name first. Plus, he was named after my real physics teacher in high school. But I can't wait for the accusations that I stole it. Sheesh. First Edgar, now this.